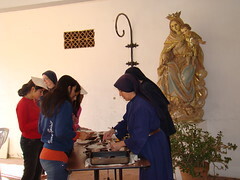 The sisters of the community of Torrent, (Valencia) held a get-together in their house during the school break of the Solemnity of the Immaculate Conception. We were going to celebrate the Immaculate Conception of Mary, to bring the girls closer to Our Mother. And like always, we did not have to plead with her too much. She was here present among us throughout the get-together. She is so good! 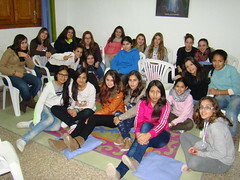 On Friday, about 22 girls arrived, from 12 to 14 years old, from Valencia and Nules (in Castellón), around 12:30 p.m. Once they all arrived, we began with what we could not go without, the Holy Mass. 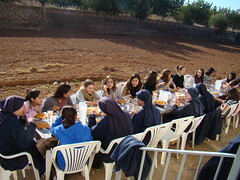 After Mass, we ate lunch outside to take advantage of the beautiful day that the Lord had given us. 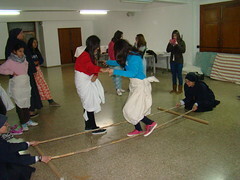 We talked for a little while to get to know each other better and played some ice-breaker games that we had prepared. Right after lunch we cleaned everything up to have arts and crafts, which we worked on throughout the day... a manger scene made of styrofome, to prepare ourselves for the coming of Our Lord on Christmas day. 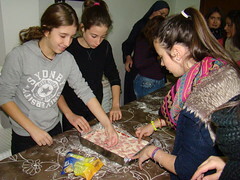 We also had the opportunity to learn how to make authentic Italian pizzas. Sister Elena, who is from Milan, was their teacher. It was fun to knead the dough. We divided ourselves into teams to fill the pizzas with all that a good pizza should have. While we waited for them to finish baking in the oven, we watched a movie to be able to comment on it afterwards, to help us in our own lives. It taught us the importance of making an effort and of perseverance, suffering what we must suffer to reach our goal, which is heaven. When we finished the movie, the pizzas were already ready, so we went to eat supper to test out our master piece and continue talking about the movie. There is no need to say that nothing was left over. The last activity of the day was a night game, where the girls had to find the sisters, hidden throughout the house, to recieve messages from Pope Francis about the love that Our Blessed Mother has for us. It seemed like we had already laughed enough for one day, so we decided that we should go to bed. But before that, we went to the chapel for a "good-night" talk that the sisters had prepared...some thoughts to help us go to sleep with the Lord in our minds and hearts. On Saturday, after waking up, eating breakfast and washing the dishes, the Servant Brothers of the community of Valencia came to hear the confessions of whoever wanted to confess and to celebrate Mass for us. We went outside to play sports in the fresh air until it was time to eat. Lunch was Chinese food. You heard right: Chinese. To participate, each one had to put on a traditional Chinese hat and then we had rice (which was slightly spanish-styled) and egg-rolls. Before it got dark, we went outside to pray the rosary walking around the neighborhood, until we came to a closeby park where we played for a time and finished praying the rosary. Once we arrived back home, there were some Asian activities prepared, because we can always learn from our brothers and sisters from other countries. The girls tried out some traditional dances from Tailand, Phillipines, Korea and China, and later they wrapped themselves up in cushions and pillows to do a similation of the Japonese sport, Sumo. All this had a spiritual application. It was a time to have fun in a good environment and learn many things. We saw a video of the conversion testimony of a young person, and how he and his wife have lived their courtship in chastity, searching together for the will of God in their lives. We ate supper a little earlier because we had a surprise prepared for the girls. As this was the eve of the Solemnity of the Immaculate Conception, we held a vigil in the chapel with the Blessed Sacrament exposed, with prayer, songs and points of meditation about Our Immaculate Mother. And afterwards, we had to celebrate it! We had a celebration with chocolate and candy and a very good envirnoment among everyone. Later, as before, we went to the chapel for a good night talk before going to bed. On Sunday morning we attended Mass in honor of Our Blessed Mother. We finished the manger scenes and had a final meeting to share our experiences of the get-together. Besides assuring us that they had had a great time, almost all of the girls said that they had grown closer to the Lord and to Our Mother in this encounter. Some said that what they liked the most was the Vigil of the night before, that they had never seen Jesus in that way (the Blessed Sacrament exposed for adoration). 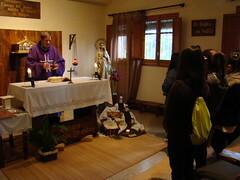 Some were also impressed by the rosary walk we did, which was a completely new experience for some. To finish off the meeting, each girl received a little gift with some cookies and a sentence of Our Lady dedicated especially to her, as a souvenir from the get-together. The get-together finished after lunch on Sunday and they all left very happy. There is no doubt that Our Mother organized the whole encounter, and that she has touched the heart of each one of the girls in a way that only she knows how. We hope to repeat the experience soon, so that we may continue getting closer to God, opening ourselves to his grace and will, and to allow the Blessed Virgin to continue working in our hearts, making us more spiritual women and a better image of her.